Hotel Notre Dame ***. 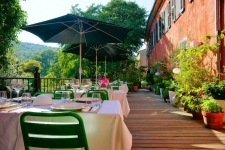 A boutique hotel on the edge of cobbled Collobri¨res, with wonderful views of the Massif des Maures, is a 18th-century staging post, a delicious modern hotel. Its inspired creators, Nili and Olivier € from the worlds of fashion and wine €" speak several languages, embrace all nationalities and love what they do. They have named each bedroom after a precious stone €" saphire, jade, coral ...€ and guests, on booking, are encouraged to pick the colour of their choice. Imagine cool floor tiles, glowing paintings, thick cream curtains, repro Louis XIV tables, bright mosaic showers and beautiful stone ceilings washed in white. The Pearl Suite has three windows and is full of light, and some rooms have divans that double up as child beds (families are welcomed with open arms). Outside are a lovely tranquil terrace at riverside and an eco-friendly pool, fenced and safe for children. As for the food, there are four different kinds of breakfast.